ArcelorMittal exhibited at BAU 2017 in the Flat, Long and Construction products categories. The Flat Products segment presented Granite® Silky Shine and Granite® Silky Mat, two new organically-coated steels with innovative surface textures. Granite® Silky Shine is primarily used for façade systems with a high-gloss, luxurious cladding to lend a unique aesthetic appearance to any building. Granite® Silky Mat is an elegant steel, offering matt textured or smooth surfaces suitable for all façade requirements. 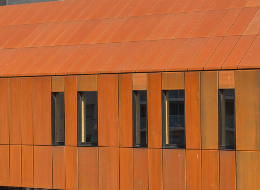 Flat Products also presented Indaten®, a corrosion and weather-resistant steel with added copper to make it resilient to climatic influences. Further alloy components are used to increase its tensile strength and improve its forming properties. Whether it is for the Luxembourg Pavilion at World Expo, sound barriers on the Italian A14 motorway, for containers, fences or outdoor equipment – with a thickness range of 0.5 – 80 mm, low maintenance requirements, a life expectancy of more than 80 years and a 100% recycling rate, Indaten® is not only attractive for many fields of application but is also inexpensive, aesthetically pleasing and sustainable. BAU is a leading world's trade fair for architecture, materials and systems in the construction industry, takes place every two years. Everyone involved in the international community for planning, building and designing buildings comes together here—i.e. architects, planners, investors, representatives of the industrial and commercial sectors, the building trades, etc. BAU showcases the latest products and materials for commercial and residential construction and interior work for both new-build and renovation and modernization. It is the place where concrete solutions and future-oriented ideas for meeting global, ecological and social challenges are presented. It's forums, special shows and gatherings make the fair the most important information and inspiration platform for the entire industry. In 2015, on 183,000 square meters of exhibition space, BAU attracted more than 2,000 exhibitors from 42 countries and 250,000 visitors from 156 countries. Bauforumstahl (bfs) promotes steel in construction. It is a forum about architecture, resource-efficient and economical planning and building as well as standardisation. Bauforumstahl represents approx. 500 members along the entire process chain: steel manufacturers, steel traders, steel fabricators, suppliers, galvanising plants, raw material suppliers and manufacturers of fire protective coatings, planning offices and scientists. The organization provides independent advice and knowledge transfer and is an open platform for a wide variety of activities.